It’s been 2 years since we’ve been with our friends, and even longer since I’ve done a power rankings. Lucas, are you watching Thrones yet? It’s better than Westworld. 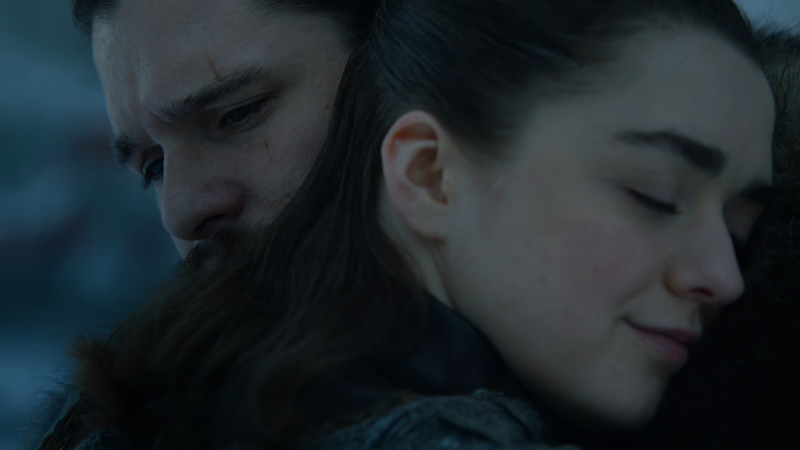 This week it was a lot of reunions, Jon Snow and his kinda siblings, Arya and Gendry, Arya and The Hound, Me and looking for better than legitimate streams of GoT, Me and worrying about writing this, Me and procrastination, Yara and Theon Greyjoy, the list goes on and on. The first stream I was watching crashed from too many people, so it got caught in a loop early on in the opening scenes where all of Daenerys’ army is coming into Winterfell, and there was a bit where Grey Worm and Missandei were coming in and the camera cut between them and these two white folks in the crowd who had clearly never seen black people before. Are they going to survive winter? Doubtful, but they had a huge impact on me personally. The stream was caught in a loop where it cut to one pair, and then the other, then back to the first pair, then again, back and forth forever. I had originally thought that the director (David Nutter) was trying to make some kind of heavy-handed political commentary, but nope, turns out that the stream just fell apart all over itself. Oops. Thrones like to go back to this well often, it’s been a few years though, so I understand they needed to get a couple out right off the rip. Tyrion slams that old bald spider Varys with a crack about his lack of nuts, and later on down in Kings Landing, Euron Greyjoy— or was it Jai Courtney from Suicide Squad? That’s a reference that is not only already dated, it will only age worse, but it was either that or Liev Schrieber in Wolverine Origins, an even more washed reference. It’s tough being in your 30s, damn this is a long and pointless aside— cracks a joke about Theon having no bepis. Classic Euron. A little shocked nobody called out Grey Worm, give it a couple of weeks though. Dude, how old are you meant to be? Haircut is looking fresh, he has a dope new cape with the fur, Arya definitely noticed, though she’s probably like 10 on the show, but honestly, age seems to be the least of anyone’s concern in this series, how old is anyone really? Everyone died when they were like 40 right? Jon Snow is probably like 15. Anyways, he seems to have a new job that he really likes making dragonglass weapons for everyone, a big step up from being sent north of the wall to capture a wight. Even though The Hound comes by and antagonizes him and calls him gay— which by the way hound, it’s 2019, get it together— after he does him a solid and makes him a big ol’ axe, he seems happy there. I dunno. He looks about 34 these days, but you can’t blame him for that, he’s had a rough couple years. If anyone ever looked at me like this, I’d probably curl up in a ball and turn into husk instantly. He destroyed Jamie Lannister with a withering stare, and while he may not have his right hand anymore, Jamie certainly has the confidence of a man with at least four right hands. He also made Sam tell Jon he’s been banging his aunt, a very alpha move. He also glared at Daenerys something fierce when she got to town. What a guy. Maybe the real winner is actor Isaac Hempstead Wright, who has the easiest job this episode, he has like 4 lines and just stares lots. Keep getting those cheques, baby. Yeah his uncle made jokes about his lack of a peepee, but he did free his sister with the help of some other guys. Was she on a boat? She was on a boat right? Cause how did they get off that boat so quickly? There were like a billion mean Greyjoy ships in the harbour, I can’t imagine they killed everybody, I dunno, just asking. The Theon Redemption Tour is rolling again, as he is off to Winterfell to probably have some more uncomfortable conversations with everyone, and probably die heroically. Sorry Bran, but nobody glared harder than Sansa this week. Like, pretty much anytime Daenerys showed up. I’ll let her stares to the talking. Here’s a little secret, I have to Google how to spell “Daenerys” every time. This is going to be a long season for me. Who is better than Bad Boy Bron? He got a sick crossbow for FREE, do you know how much a crossbow costs? Several hundred dollars easy, and that’s not even taking into account inflation, if you go back to dragon times that’s like 500,000 sheep probably. Clearly he’s heading for a Lannister reunion, does anyone really think he’s actually going to kill Jamie and Tyrion? Hell no, he’s gonna get hammered, bust some cheeks and fight for the living. Bron loves living! Anyways, I’m mostly just jazzed to see him again. He rules. 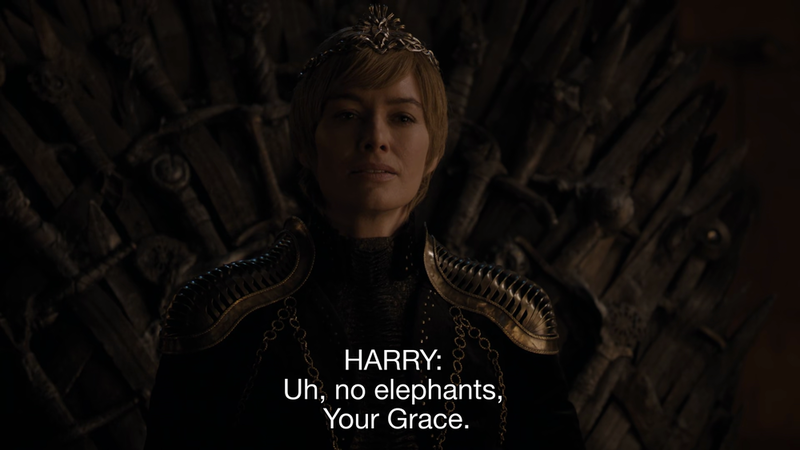 Cersei, she really wanted those elephants. 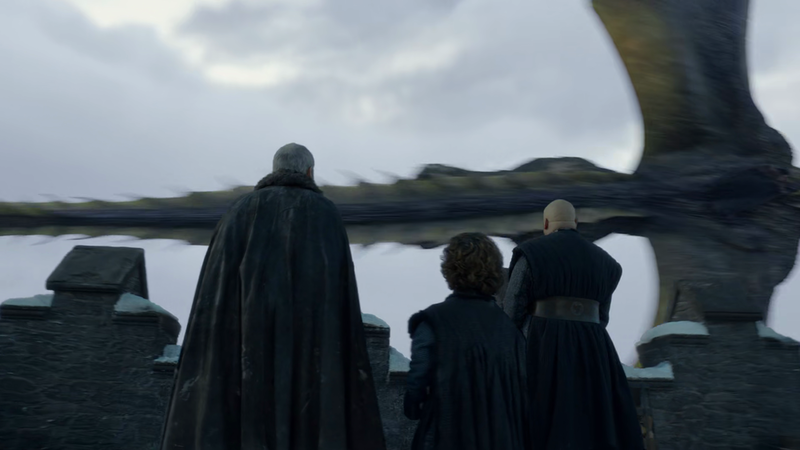 CG dragons, they look… rough when juxtaposed with humans, on their own they look perfectly ok but something about they way they look interacting with a real actor is quite unfortunate and cheap looking, though I bet they cost several dollars. Also, that like 400 minute long dragon ride in the middle of the episode was a waste of time.